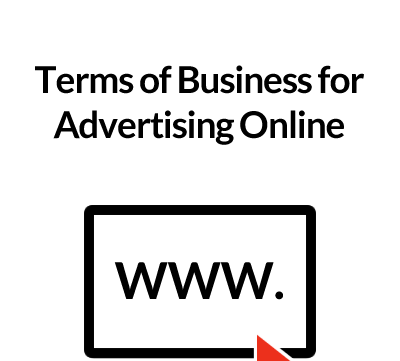 This agreement is designed for use by the owner of a building or other structure who wishes to grant the right for advertisement boards or hoardings to be affixed to it. A schedule is included, allowing parties to detail affixing methods, boards and the display site. You need this document if you are the owner of a building, looking to make extra income by granting the right for advertising materials, billboards or hoardings to be attached to your premises. 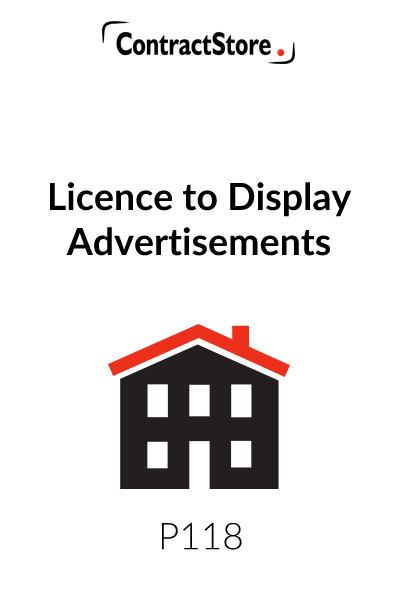 It sets out the licence fee, the duration of the licence and the arrangements for the licensee to get access to erect advertisements as well as other obligations and duties of the owner and the advertiser. The right is granted by way of a licence for a fixed term and it can then be renewed by the parties from month to month. The owner should take into account the fact that the existence of the Agreement may make it difficult to sell the building or to obtain a mortgage. A long period may not, therefore, be appropriate. The owner may be the owner of the freehold of the building or a tenant or lessee under a lease. 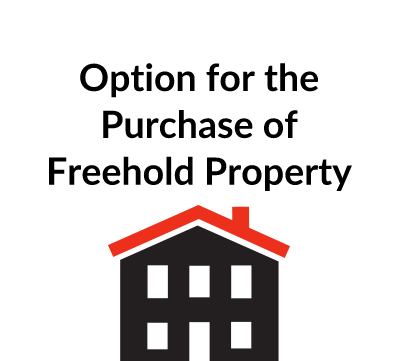 If the owner is not the freeholder, then the right to grant the licence may be prohibited under the terms of any tenancy or lease, or the landlord’s consent may be required first. If there is a mortgage on the building, then it may prohibit the grant of the licence and so the position with the lender should be checked. The full name of the Owner and address should be given at the beginning. If there is more than one, then all names should be given. If the Owner is a company, then its full company name and its registered office should be given. The word “Owner” should not be altered. The full name of the Licensee and address should be given. The Licensee should be the person or company which owns the Boards. If there is more than one, then all names should be given. The Licensee is to have access to land so that the Boards can be installed and maintained. The “Access Land” is defined by reference to a plan. If no plan is available, then the area of land should be defined. 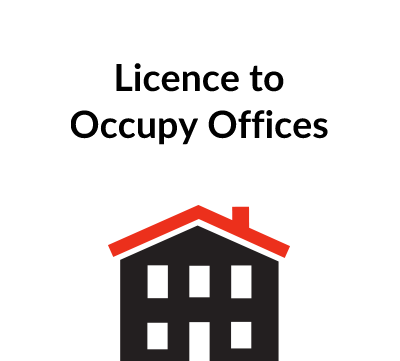 The postal address of the Building should be inserted and also the amount of the Licence Fee and the Licence Period. The details in Parts 1, 2 and 3 in the Schedule should be completed. A full description should be given in each case. The rights granted are set out in clause 2 and include the right to illuminate the Boards. The Licensee may be able to put in a supply of electricity. If so, then a separate meter may be required. Alternatively, the Licensee will have to reimburse the Owner for the supply if it is taken from the Building. You will have to agree a rate for this and adapt the Agreement accordingly. 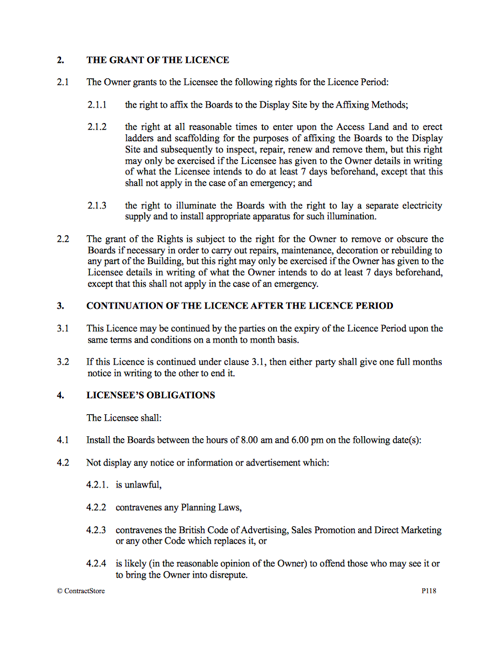 If the Licensee does not wish to illuminate the Boards, then clause 2.1.3 should be deleted and clause 4.5 amended by the deletion of the last few words. If the Licensee requires other rights, then these should be added to clause 2. These are set out in clause 4. You may want to add others to suit the particular case. Clause 7.5 provides that the Owner is not liable by reason of the rights being exercised. However, a person injured by the Boards collapsing, for example, may have a claim against the Owner. The claimant will not know the details of your arrangement with the Licensee. In any event, the Owner may be legally liable to the claimant. The Owner, therefore, should look into the position to see if the Building insurance policy covers the situation and, if not, separate cover taken out. If the Owner is registered for vale added tax, then advice should be taken to see if it is payable on the Licence Fee.